January 3, 2015 was my first day in Puerto Vallarta. On a freezing winter day in Toronto I got up at 2:30 am, arrived at the airport an hour later and our plane finally took off at 6:30 am. After a bumpy flight and a brief stop in Dallas I landed around 2:30 pm. But the 12 hours of travel time were worth it when I felt the warm tropical sunshine on my skin. Right when I walked out of the arrivals area I got reeled in by some sales people who try to get newly arrived visitors on a timeshare tour. 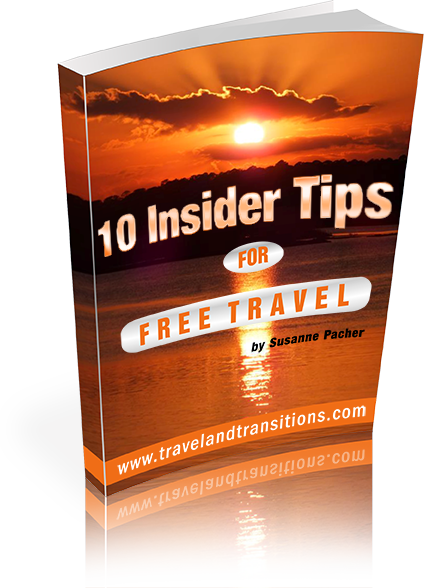 As a timeshare owner myself and as a travel specialist who always wants to learn about new options in travel I agreed and got rewarded with a free taxi ride to my hotel. 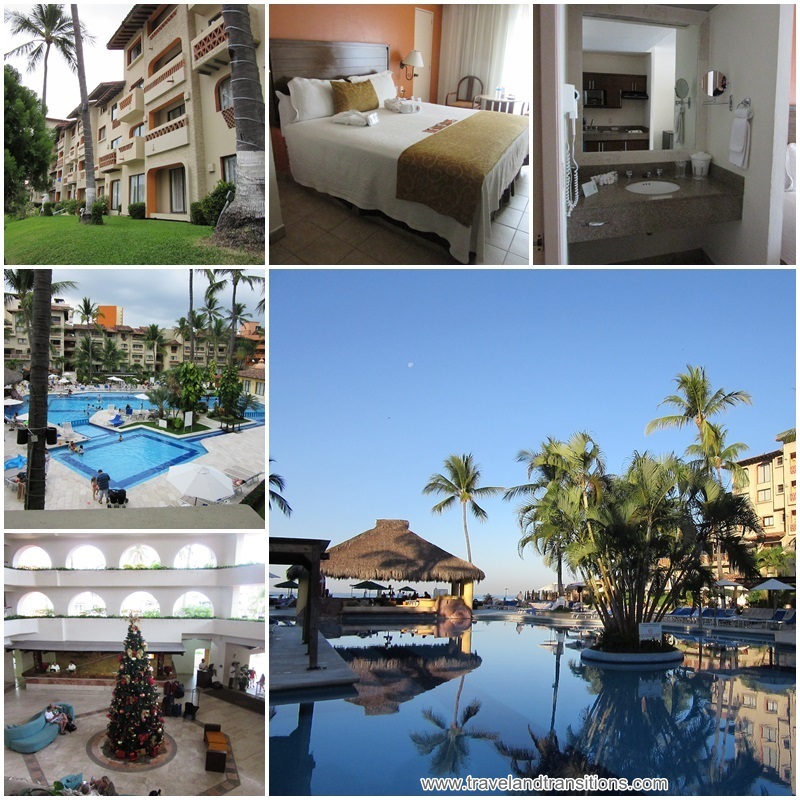 For the first week I stayed at the Canto del Sol, an optional all-inclusive resort in Puerto Vallarta’s hotel zone. It is very popular with families and couples who are looking for a conveniently packaged beach vacation. For me, it was going to be a good home base for my explorations all around Puerto Vallarta and the surrounding region. I ended up with a nice bachelor unit overlooking the pool with a partial ocean view and counted myself very lucky because some of the units here face the rear side of the building and a parking lot. The view from my room was very pleasant, with a nice pool, palm trees and the Pacific Ocean in the background. Since I was going to travel around a lot I did not book the all-inclusive package as I was going to spend very little time at the resort anyway. But with its close proximity to downtown it was a good base camp for the first week. Towards 4:30 I was finally ready to embark on my first explorations of Puerto Vallarta and I decided to walk instead of taking a taxi or a bus. The buses are actually very convenient and very inexpensive, at 7.50 Pesos the cost works out to about US$ 0.50 for every bus ride. 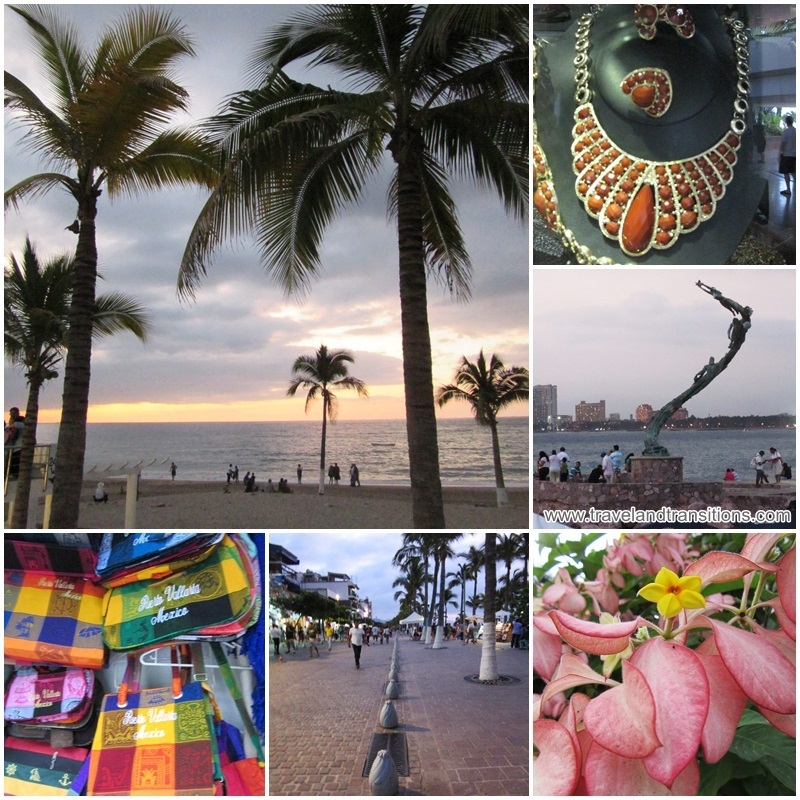 After walking through the hotel zone I continued on the main street (Mexican Highway 200) with its many tourist oriented shops and restaurants until I reached the Malecon, Puerto Vallarta’s famous ocean-front esplanade. In recent years, the former waterfront street has been turned into a pedestrian-only area and it makes for a fabulous outing, either to have dinner or do some people watching. As the sun was setting over the Pacific Ocean I was startled by a haunting tune played by a flute and accompanied by a drum. I couldn’t quite make out where the sound was coming from, but then I looked up, and at the top of a very tall mast were a flute player / drummer and four more men, waiting to launch themselves off the little wooden platform tied to a long rope, slowly rotating around the mast as they were slowly descending to the ground. This “Danza de los Voladores” (Dance of the Flyers) is an ancient Mesoamerican ritual that has been designated an Intangible Cultural Heritage by UNESCO. From here I continued on to the “zocalo”, the famous main square of Puerto Vallarta that is centered around a “kiosco” (bandstand). The benches here are very popular with the locals and the tourists. Just west of the zocalo and next to the ocean front is the Los Arcos amphitheatre. This gathering spot is always packed with people watching cultural events, music or humorous performances. On the other side of the Zocalo you can see the famous steeple of “Nuestra Señora de Guadalupe”, Puerto Vallarta’s main church with its iconic crown at the top. 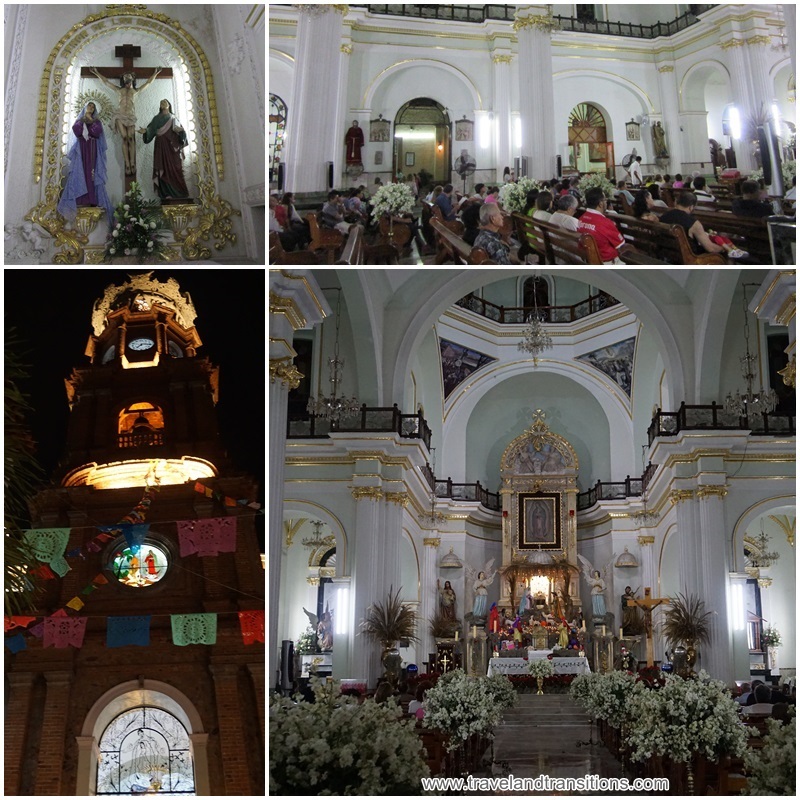 I crossed a busy road, walked past some retail stores and into the Church of Guadalupe which was decked out for the “Dia de los Reyes Magos” (Epiphany or Three Kings Day). Many people were inside the church, praying, as Mexico is a still a country with strong Roman Catholic traditions. This church is truly the most famous landmark of Puerto Vallarta, and its copper crown can be seen from many places around the city. The church is actually quite new: the foundations were laid in 1903 and it was finally completed in 1921. 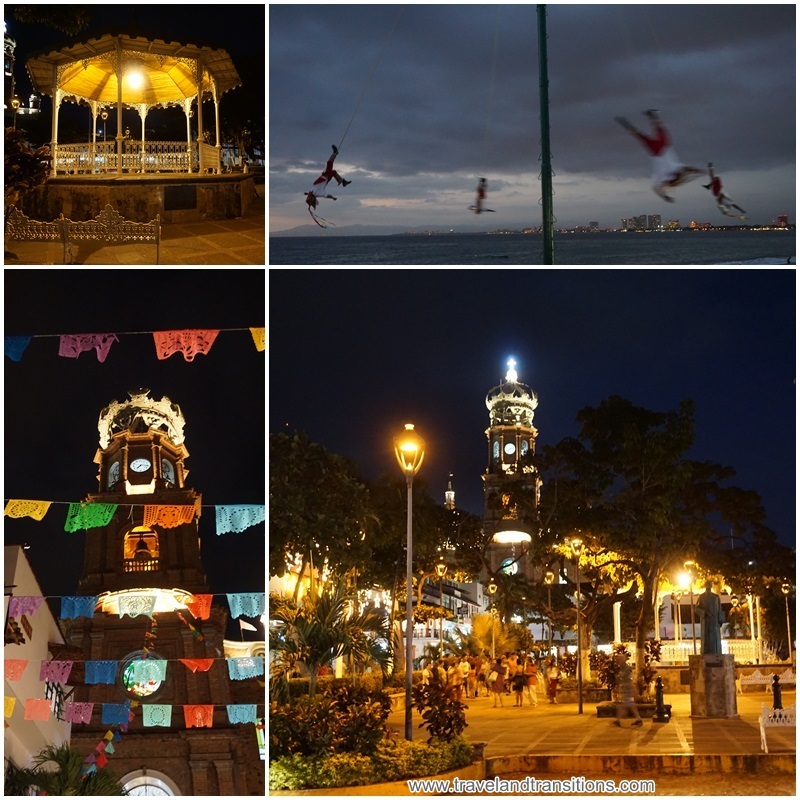 The zocalo with the amphiteatre and the Church of Our Lady of Guadalupe are truly the heart of Puerto Vallarta and I was looking forward to exploring this area in daylight.